The Nesco TM-1 Tea Maker is perfect for making all kinds of teas. This 1200 Watts tea maker heats water, steps leaves, and keeps tea warm so that you can enjoy your tea. The tea maker features a stainless steel steeping chamber which holds loose leaf tea without seepage of leaves results in perfect steeping. It also control the strength of the tea with adjusting steeping time. 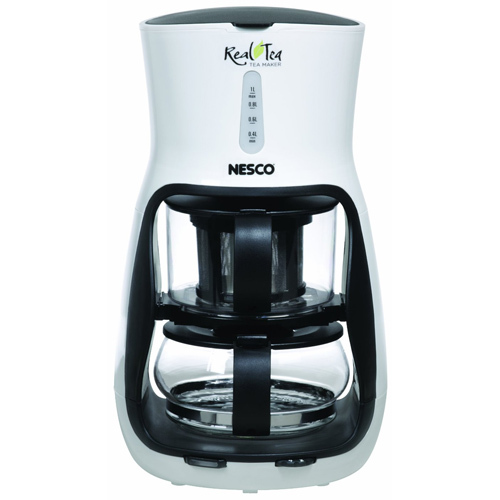 With easy-to-use controls, this tea maker needs only to set the minutes and press the lighted start button. An automatic one-hour keep warm feature allows the tea drinker to always have a cup of tea ready to drink. The Nesco TM-1 has many exciting features for users of all types. You can extend the lifetime of your Nesco TM-1 with the purchase of a FactoryOutletStore Factory Protection Plan. See the Nesco TM-1 gallery images above for more product views. The Nesco TM-1 is sold as a Brand New Unopened Item.